The prophet, Habakkuk, wrote this bible book that bears his name. His name in the Hebrew language is Chabaqquwq that comes from the root word Chabaq. The name means to clasp the hands or for two people to hold each other, possibly in a loving embrace. Possibly, God and Habakkuk were embracing one another in a warm, spiritual love relationship. He appears to write this book as poetry based upon some of his personal experiences with God. Chapter 3 is a psalm or song of praise and adoration to God because of Who He is. <!-black-> What are some things that we know about Habakkuk? We know very little about this prophet. It is probable that he was a Levite as he was a song writer and played music or sang in God's temple. He probably knew the prophets Jeremiah, Nahum, and Zephaniah in Judah. This bible book was written between 625 to 606 B.C., probably around 608 B.C., early in King Jehoiakim's reign. It was written from somewhere in Judah, possibly in Jerusalem. Habakkuk wanted some answers from God. He had some profound questions. God gave the prophet the answers to his questions. Whenever you or I have questions that only God can answer, it is good to communicate with our Heavenly Father and ask Him. God is far above us in all areas of life, but He often comes down to our level to answer the desires of our heart. <!-black-> Habakkuk is a book of the bible regarding questions and answers between Habakkuk and God. It is not only a book containing Hebrew poetry but also a song of praise and glory to God. 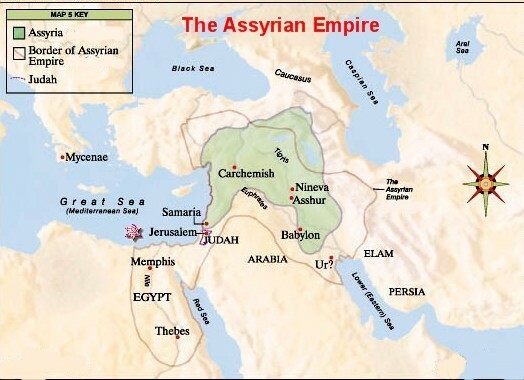 The southern Kingdom of Judah was all that remained after the 10 tribes of the northern Kingdom of Israel were deported to Assyria many years previous. The two kingdoms had been separated by civil war. The southern Kingdom of Judah should have repented and followed God with all of their hearts after having witnessed the deportation of the 10 tribes but they failed to do so. Instead, idol worship became common place. The fall of the Assyrian Empire had taken place. The prophet, Nahum, had prophesied that. <!-black-> Then a power struggle took place between Egypt and the Babylonian Empire. Two great armies were going to clash in an epic battle. As the Egyptian armies marched north through Judah, King Josiah of Judah fought them in battle and was killed in action. The Egyptians continued north and fought the Babylonians at Carchemish in 605 B.C. The Babylonians won this war and conquered much more territory. They eventually conquered Judah, burned Jerusalem, and deported the folks of Judah to Babylonia as slaves. 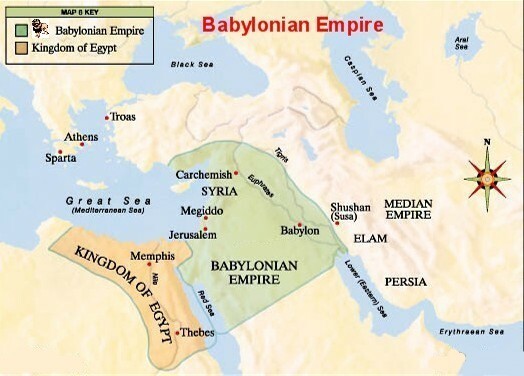 The Babylonian Empire lasted from about 612 to 539 B.C. (Habakkuk 1:6) but had not yet conquered Judah (Habakkuk 3:16). 586 B.C. Jerusalem was sacked and burned to the ground. "The Lord God is my strength"- Habakkuk 3:19. 3) Chapter 3: Habakkuk's song of praise and his vision of the coming of Christ. <!-purple-> "How long, O Lord, must I call for help?" <!-purple-> "O Lord, how long shall I cry, and You will not hear? I cry, but You do not come to save. You do not appear to listen!" "Must I forever see this sin and misery all around me? Wherever I look, I see destruction and violence. I am surrounded by people who love to argue and fight. The law has become paralyzed and useless, and there is no justice given in the courts. The wicked far outnumber the righteous, and justice is perverted with bribes and trickery"
<!-red-> "...for I will work a work in your days, which ye will not believe, though it be told you. I am raising up the Babylonians to be a new power on the world scene..."
Habakkuk had many questions that he needed answers to. It is not wrong to ask God questions. God tells Habakkuk that He is going to change the government and society of Judah. The people of Judah were infected with sin, idol worship, violence, and moral wickedness. Habakkuk, as part of the godly remnant, may have been persecuted for his faith. He didn't like it and took his question about it to God. <!-black-> In some instances, like with a human body, the Great Physician cannot cut out the malignant cancer unless He surgically operates on the area in the body that is affected. He will cut and remove the cancer. He may clean the cancer from the bodily organ and then put the organ back into the body and help it to heal. The part that He puts back and helps to grow is the godly remnant of Judah. He will use the Babylonian army to do the initial surgery and kill all malignant spiritual growth. In the end the human body will be healed and will be better off than before the surgery. In other words, God is going to heal Judah in His own way and in His own time. Habakkuk's persecutors, personally, and the evil ruling class, politically, will be judged. Some of those individuals will be slain and others will be deported as slaves to areas in the Babylonian Empire. <!-black-> This was basically God's answer to Habakkuk. God is great and can see the total picture of what He is doing. In other words, He can see over the forest to see it all. All we can see are the trees in front of us. Have you ever looked at a hand crochet cloth on a person's lap while they are working on it? In this instance, God is doing the crochet. From His perspective He sees a wonderful masterpiece that He is creating. From our perspective all we can see is the back side of it. We see the knots, the twisted thread, and the tangles that look pretty grotesque and confusing. You and I can only see a small part of God's plan at one time. We are only fallible and mortal and are very limited in our abilities. Sometimes a person of faith can find themselves bewildered by many contrary circumstances. That happened to Habakkuk and it can happen today to any of us. <!-purple-> "Beware therefore, lest what has been spoken in the prophets come upon you: Behold, you despisers, Marvel and perish! For I work a work in your days, a work which you will by no means believe, though one were to declare it to you. So when the Jews went out of the synagogue, the Gentiles begged that these words might be preached to them the next Sabbath"
<!-purple-> "You are of purer eyes than to behold evil, and cannot look on wickedness. Why do You look on those who deal treacherously, and hold Your tongue when the wicked devours a person more rightous than he?" "...You have decreed the rise of these Babylonians to punish and correct us for our terrible sins. You are perfectly just in this. But will You, Who cannot allow sin in any form, stand idly by while they swallow us up? Should you be silent while the wicked destroy people who are more righteous than they? ...will You let them get away with this forever? Will they succeed forever in their heartless conquests?" <!-red-> "You (Babylonians) have plundered many nations; now they will plunder you. You murderers! You have filled the countryside with violence and all the cities, too. How terrible it will be for you who get rich by unjust means! You believe your wealth will buy security, putting your families beyond the reach of danger. But by the murders you committed, you have shamed your name and forfeited your lives"
<!-black-> God shared with Habakkuk His ultimate plan. God acknowledges that the Babylonians are wicked but their own evil ways will destroy them. Cruelty, pride, drunkenness, and idol worship will destroy them. In other words, He will use the Babylonians to judge Judah and then He will judge the Babylonians at a later time. <!-black-> Habakkuk has a hard time seeing God's will in Him using the Babylonians. It was not necessary for Habakkuk to understand this, he simply had to accept it on faith. And then God comforts him in letting him know that He will also, eventually, judge the Babylonians. <!-black-> How is Habakkuk's question relevant to you or I? Sometimes, you or I may not understand God's ways of dealing with us and He may not reveal His plans to us. But, He simply wants us to trust Him in spite of our adverse circumstances. How can God allow His chosen people by covenant to be conquered by idol worshipping gentiles? In other words, how can evil triumph over evil? <!-black-> God tells Habakkuk that He will eventually judge the Babylonians for their sins and this was not an entirely new concept. Did God ever use a sinful, gentile nation before to bring judgment on His people in the past? Yes. God used the Assyrians to judge the 10 northern tribes of Israel. <!-red-> "Destruction is certain for Assyria, the whip of my anger. Its military power is a club in My hand. Assyria will enslave My people, who are a godless nation. It will plunder them, trampling them like dirt beneath its feet. But the king of Assyria will not know that it is I Who sent him. He will merely think he is attacking My people as part of his plan to conquer the world"
<!-black-> The Assyrians conquered and deported the folks of the Kingdom of Israel. And after God used the Assyrians in judgment against Israel, He judged Assyria for its sins. God is explaining to Habakkuk that He will use the Babylonians in much the same way that He used the Assyrians. Only a BIG GOD is powerful enough to move nations and armies and be in total control of them. God still moves in the affairs of men. <!-black-> How can a holy God use a sinful gentile nation to accomplish His purposes? How can He allow evil people to correct other evil people? In other words, Habakkuk is wondering if a wicked doctor, who is a surgeon, can be used to remove a malignant and cancerous tumor from a wicked patient to make the patient well. This is a paradox to you and I. God often uses a paradox to show how great He truly is. God is a GREAT GOD and totally sovereign. He is all powerful and all knowing. There is nothing too hard for Him. He created the heavens and the earth and all that is in the earth and on the earth. God, who is infinite, cannot be always understood by folks with a sinful, finite mind. God is above all and in perfect control of His universe. <!-red-> "With God all things are possible"
(Mark 9:23, Matthew 19:26). <!-black-> Since He is so great He will use the gentile Babylonians as an instrument for Judah's correction. <!-black-> How are the folks of Judah to respond to the Babylonian invasion of their homeland? Habakkuk encourages the godly remnant in the land to trust God. He has everything under control. The Babylonians will conquer them and make them slaves but in due time the Babylonians will also be judged by God. In the end, righteousness and justice will prevail. <!-black-> How does God view sin? God hates sin and judges those who indulge in it and will one day eradicate it from His universe. He sees the secret sins and He sees the blatant sins done in the open. It may appear to us that God does not care. It is true that He may not do anything about them immediately. Can some folks falsely assume from His silence or seeming inactivity that He is permissive about their sins? No. God has not changed His mind, His law, His standards of holiness, or His procedures. Even though His judgment or execution against an evil work is not performed speedily, His judgment is sure to come eventually. There was corruption and lawlessness in their political system. The righteous were oppressed (Habakkuk 1:4 & 13). The people were living in open sin and rebellion against God. They were worshipping idols (Habakkuk 2:18-19). The poor of the land were being oppressed. <!-purple-> "...You have decreed the rise of these Babylonians to punish and correct us for our terrible sins..."
<!-black-> God usually warns before He judges. In this passage of scripture God warns Judah that if they refuse to repent, He will bring the Babylonians against them. 10,000 of them or so will be deported to Babylonia as slaves and Jerusalem will be burned to the ground. <!-black-> Did they repent and forsake their worship of idols? No. Therefore, God allowed the Babylonians to conquer them, deport them as slaves, and destroy Jerusalem. <!-purple-> "We will not listen to your messages from the Lord! We will do whatever we want. We will burn incense to the Queen of Heaven and sacrifice to her just as much as we like- just as we and our ancestors did before us, and as our kings and princes have always done in the towns of Judah and in the streets of Jerusalem. For in those days we had plenty to eat, and we were well off and had no troubles! But ever since we quit burning incense to the Queen of Heaven and stopped worshiping her, we have been in great trouble and have suffered the effects of war and famine. And, the women added, do you suppose that we were worshiping the Queen of Heaven, pouring out drink offerings to her, and making cakes marked with her image, without our husbands knowing it and helping us? Of course not!" <!-red-> "No amount of soap or lye can make you clean. You are stained with guilt that cannot be washed away..."
<!-red-> "For though you had defeated the whole army of the Chaldeans who fight against you, and there remained only wounded men among them, they would rise up, every man in his tent, and burn the city (Jerusalem) with fire"
<!-purple-> "The Lord gave a message to Jeremiah after Nebuzaradan, captain of the guard, had released him at Ramah. He had found Jeremiah bound in chains among the captives of Jerusalem and Judah who were being sent to exile in Babylon. The captain of the guard called for Jeremiah and said: The Lord your God has brought this disaster on this land, just as He said He would. For these people have sinned against the Lord and disobeyed Him. That is why it happened"
<!-red-> "Behold, I will send for many fishermen, says the Lord, and they shall fish them; and afterward I will send for many hunters, and they shall hunt them from every mountain and every hill, and out of the holes of the rocks"
<!-red-> "Why do you protest your punishment- this wound that has no cure? I have had to punish you because your sins are many and your guilt is great. But in that coming day, all who destroy you will be destroyed, and all your enemies will be sent into exile. Those who plunder you will be plundered, and those who attack you will be attacked. I will give you back your health and heal your wounds, says the Lord"
<!-red-> "Then, after the seventy years of captivity are over, I will punish the king of Babylon and his people for their sins, says the Lord. I will make the country of the Babylonians an everlasting wasteland"
<!-red-> "But do not be afraid, Jacob, My servant; do not be dismayed, Israel. For I will bring you home again from distant lands, and your children will return from their exile. Israel will return and will have peace and quiet, and nothing will make them afraid. Fear not, Jacob, My servant, says the Lord, for I AM with you. I will destroy the nations to which I have exiled you, but I will not destroy you. But I must discipline you; I cannot let you go unpunished"
<!-purple-> "Seek the LORD while He may be found; call on Him while He is near. Let the wicked forsake his way, and the unrighteous man his thoughts; and let him return to the Lord, and He will have mercy on him; and to our God, for He will abundantly pardon"
<!-red-> "For My thoughts are not your thoughts, nor your ways My ways, says the Lord. For as the heavens are higher than the earth, so are My ways higher than your ways, and My thoughts than your thoughts"
<!-red-> "I am the Lord, the God of all the peoples of the world. Is anything too hard for Me?" <!-purple-> "...for their own strength is their god"
<!-black-> "...whose might is their god" or "...their own strength is their god" is an expression that means that the Babylonians worshipped their own military greatness. <!-black-> The Babylonians thought they were so superior. They worshipped their own great sense of power and they took credit for conquering Judah. The God of the Jews was not the source of their justice. However, they made the wrong conclusion as they did not give all of the glory to God for His help. God indicates that He delivered the folks of Judah to the Babylonians because they had sinned against Him. God was judging His own people. <!-purple-> "What have you gained by worshiping all your man-made idols? How foolish to trust in something made by your own hands! What fools you are to believe such lies! How terrible it will be for you who beg lifeless wooden idols to save you. You ask speechless stone images to tell you what to do. Can an idol speak for God? They may be overlaid with gold and silver, but they are lifeless inside"
<!-black-> The devil and his imps were active in Judah. How? Satan was trying to get worship for himself through idol worship and trying to turn the folks there away from God. <!-black-> Sometimes a godless college professor might say things to try to destroy a Christian's faith in God. What kind of things? "Do you believe that a God of love would permit suffering in the world?" Or, "Do you believe that a kind God would allow folks to kill each other in war?" Or, "God created evil, therefore God must be evil." <!-black-> In my opinion, the devil used a similar method of twisted logic on Eve in the Garden of Eden. I can imagine him saying to her: "Go ahead and eat of the fruit of the tree of the knowledge of good and evil. If you eat it, your eyes will be opened and you will become like God. A good God would not forbid you from eating of that tree." Satan was trying to undermine or cast doubt on her confidence in the goodness of God. It is an old trick of the enemy that he still uses today. <!-black-> Satan influenced the folks of Judah to sin against God. Satan was really entrenched there so God took action to solve the problem. <!-black-> God created all of His angels good and with free will. So He did not create evil. Each of the fallen angels became evil due to their bad choices and they act that way today for the same reason(s). One time a certain university in Illinois invited one of "the greatest minds" to lecture in their theological education center. This distinguished man with a doctorate degree spoke for two and one half hours proving that the resurrection of Jesus was false. He quoted scholar after scholar and book after book. He concluded that since there was no such thing as the historical resurrection, the religious tradition of the church was groundless, emotional mumbo jumbo, because it was based on a relationship with a risen Jesus, who, in fact, never rose from the dead in any literal sense. <!-black-> He then asked if there were any questions. After about 30 seconds an old preacher with a head full of white hair stood up in the back of the auditorium. "Docta sir, I got one question," he said as all eyes turned toward him. He reached into his sack lunch and pulled out an apple and began eating it. "Docta sir ... CRUNCH, MUNCH... My question is a simple question ...CRUNCH, MUNCH... Now, I ain't never read them books you read...CRUNCH, MUNCH ... and I can't recite the Scriptures in the original Greek...CRUNCH, MUNCH ... I don't know nothin' about Niebuhr and Heidegger... CRUNCH, MUNCH... He finished the apple. "All I wanna know is: This apple I just ate - was it bitter or sweet?" The speaker paused for a moment and answered in exemplary scholarly fashion: "I cannot possibly answer that question, for I haven't tasted your apple." The white-haired preacher dropped the core of his apple into his crumpled paper bag, looked up at the speaker and said, "Neither have you tasted my Jesus." <!-black-> The 1,000 plus in attendance could not contain themselves. The auditorium erupted with applause and cheers. The speaker thanked his audience and promptly left the platform. <!-black-> Have you tasted Jesus? God has risen... and He's coming back one day! <!-purple-> "Taste and see that the Lord is good; blessed is the man who takes refuge in Him"
(Psalm 34:8). If you have, rejoice! <!-purple-> "Are we but fish to be caught and killed? Are we but creeping things that have no leader to defend them from their enemies? Must we be strung up on their hooks and dragged out in their nets while they rejoice? Then they will worship their nets and burn incense in front of them. These nets are the gods who have made us rich! they will claim. Will You let them get away with this forever?" <!-black-> Since Jeremiah the prophet was being personally persecuted for telling the folks of Judah that the Babylonians were going to conquer them, I assume that Habakkak is getting the same persecution for preaching the same thing. I imagine that he was going through a personal trial. Even if he wasn't, he would soon have to face a national trial along with everyone else in Judah as the Babylonians finished their work in Judah. How long, Lord, will you allow evil people in government to persecute the one who loves you? Why are the wicked allowed to triumph over God's people? Why don't You step in and do something immediately and put a stop to it? I can imagine the prophet, Daniel, in Babylon asking those same questions to God about the time that he was thrown into a den of lions there. (John 8:47). They do not love our Saviour like we do. God may choose to introduce them to us because He is proud of each of His children and trusts each of us to keep shining forth His light in the midst of deep spiritual darkness. He wants them converted to Christ. And sometimes it is not easy. <!-black-> God may answer that He is going to make sure that each of your persecutors is judged. What they have done to you, they will receive back in full measure. That is the spiritual law of sowing and reaping. <!-black-> God is moving in a very definite way. If you and I want an answer to our problems, Habakkuk gives us the answer. That answer is simply this: God is the answer to our problems. God is our strength and our joy. <!-black-> God seems to indicate that those who oppress the poor will be held accountable. <!-black-> Are you going through a time of persecution in your life right now? <!-black-> God did not create evil but sometimes He permits evil to be unleashed on our world, our nation, or ourselves. He permits it for His own reasons. If you are wondering about a specific circumstance in your life, then do what Habakkuk did and ask the Lord in prayer about it. I have done this from time to time and God has been kind to give me the answers to many of my questions. And you may need answers from God some day also. <!-black-> Why is Habakkuk's question relevant to us today? A believer today may have questions. Why does not God do something and put a stop to violence, injustice, and suffering? You do not appear to be doing anything Lord. Why don't You do something? How can God allow evil to exist? How can God allow evil men or women to have superiority over Christian men or women? How can God allow the innocent to be victimized? Why does God allow some to be killed or wounded in war, natural disasters, famine, or disease? Why is God silent in times of disaster? Why doesn't God stop evil men since He is all-powerful? Why do wicked people prosper? Why does God not judge the wicked? The answer is that God will one day judge the wicked. God will do it in His own way and in His own time. <!-black-> We do not have all of the answers but we do know that we can trust God and can be assured that He is in perfect control of His universe. God is very patient. He wants no one to perish in their sins. He has provided a cross- a crucified and risen Savior- so that each of us need not perish if we love, obey, and serve Christ. (Matthew 14:30). This is God's universe- He is sovereign. He runs it to please Himself. The clay pot may not understand everything that the Potter does. All God wants each of us to do is to trust Him. <!-black-> Forgive your enemies, do good to your enemies, and love your enemies. Every Christian soldier is to use those weapons. <!-black-> God always deals with a godly remnant of people. Even in Babylonian custody a righteous remnant will be preserved to return again to Judah to worship the Lord in spirit and in truth. God's guiding and protecting hand will see them through. In the end times a righteous remnant will be preserved in much the same way. The Lord will not abandon His chosen ones. <!-purple-> "I will climb up into my watchtower now and wait to see what the Lord will say to me and how He will answer my complaint"
<!-purple-> "The just shall live by faith"
<!-black-> The major lesson of this bible book is- the just shall live by faith. <!-black-> There was a believing remnant in Judah that did not fall prey to its nation's spiritual blindness and unbelief. And in the future, when the universal Christian church embraces false doctrine and goes into apostasy, there will be a godly remnant who will stand true to God. Today, you and I are to walk by faith. <!-black-> Martin Luther was greatly influenced by this scripture as shown in the church history of the Reformation. A believer is justified by faith, not by works. One cannot work his or her way to Heaven. Salvation is a free gift by grace through faith. <!-black-> No matter what your questions are, no matter what your problems are, God has an answer for you- exercise faith in God and live accordingly. <!-black-> God through the prophet, Habakkuk, pronounces 5 woes in judgment against the Babylonians. But, these great national sins and woes may apply to any nation on earth today as well. In other words, a nation's own sins can bring it down. <!-black-> 1) Habakkuk 2:6 For seizing by force that which was not theirs. <!-black-> 2) Habakkuk 2:9-11 For covetousness and destructive pride. Covetousness is against God's 10th commandment and pride is one of the 7 deadly sins. <!-black-> 3) Habakkuk 2:12 For murder, violence, thievery, and "ethnic cleansing". <!-black-> 4) Habakkuk 2:15 For drunkenness and gross immorality. <!-black-> 5) Habakkuk 2:18-19 For satan and idol worship, sorcery, and false religion. <!-black-> All of these sins in that nation first came about from spiritual apostasy- a turning away from the living and true God, the Creator of heaven and earth. These same sins might very well bring down the nation that you or I live in today. If we see any of these sins prevalent in our society today, let's encourage as many folks as we can in our society to repent and forsake them. <!-purple-> "For the earth will be filled with the knowledge of the glory of the Lord, as the waters cover the sea"
<!-red-> "They shall not hurt nor destroy in all My holy mountain; for the earth shall be full of the knowledge of the Lord, as the waters cover the sea"
<!-purple-> "How terrible it will be for you who make your neighbors drunk! You force your cup on them so that you can gloat over their nakedness and shame. But soon it will be your turn! Come, drink and be exposed! Drink from the cup of the Lord's judgment, and all your glory will be turned to shame"
<!-black-> Drunkenness was the Babylonian's special sin. God condemns drunkenness and God condemns making drunkards of others. Drunkenness may lead to gross immorality and violence. <!-purple-> "For the violence done to Lebanon will cover you"
(Isaiah 14:7-8). These palaces of the Babylonians will one day lie in ruins (will cover you) and the Babylonians will be no more. <!-purple-> "But the Lord is in His holy temple. Let all the earth keep silence before Him"
<!-purple-> "Be silent in the presence of the Lord God; for the day of the Lord is at hand, for the Lord has prepared a sacrifice; He has invited His guests"
<!-red-> "Sing and rejoice, O daughter of Zion! For behold, I AM coming and I will dwell in your midst, says the Lord. Many nations shall be joined to the Lord in that day, and they shall become My people. And I will dwell in your midst." <!-purple-> Then you will know that the Lord of Armies (hosts) has sent Me to you. And the Lord will take possession of Judah as His inheritance in the Holy Land, and will again choose Jerusalem. Be silent, all flesh, before the Lord, for He is aroused from His holy habitation!" <!-black-> Let us praise Him and make worshipful melodies and sing songs to Him in the good times, but let us keep silent when He is angry and getting ready to judge. <!-purple-> "And the king of Egypt made Eliakim his brother king over Judah and Jerusalem, and changed his name to Jehoiakim. And Necho took Jehoahaz his brother and carried him to Egypt. Jehoiakim was twenty-five years old when he began to reign, and he reigned eleven years in Jerusalem. And he did the evil in the sight of the LORD his God. Nebuchadnezzar king of Babylon came up against him and bound him in chains to carry him to Babylon. And Nebuchadnezzar carried away some of the vessels of the house of the LORD to Babylon, and put them in his temple at Babylon. And the rest of the acts of Jehoiakim, and his abominations which he did, and that which was found in him, behold, they are written in the Book of the Kings of Israel and Judah. And Jehoiachin his son reigned in his place"
<!-purple-> "In his days Nebuchadnezzar king of Babylon came up, and Jehoiakim became his vassal for three years. Then he turned and rebelled against him. And the Lord sent against him raiding bands of Chaldeans, bands of Syrians, bands of Moabites, and bands of the people of Ammon; He sent them against Judah to destroy it, according to the word of the Lord which He had spoken by His servants the prophets. Surely at the commandment of the Lord this came upon Judah, to remove them from His sight because of the sins of Manasseh, according to all that he had done, and also because of the innocent blood that he had shed; for he had filled Jerusalem with innocent blood, which the Lord would not pardon"
<!-purple-> "In the ninth year of Zedekiah king of Judah, in the tenth month, Nebuchadnezzar king of Babylon and all his army came against Jerusalem, and besieged it. In the eleventh year of Zedekiah, in the fourth month, on the ninth day of the month, the city was penetrated. Then all the princes of the king of Babylon came in and sat in the Middle Gate: Nergal-Sharezer, Samgar-Nebo, Sarsechim, Rabsaris, Nergal-Sarezer, Rabmag, with the rest of the princes of the king of Babylon. So it was, when Zedekiah the king of Judah and all the men of war saw them, that they fled and went out of the city by night, by way of the king's garden, by the gate between the two walls. And he went out by way of the plain. But the Chaldean army pursued them and overtook Zedekiah in the plains of Jericho. And when they had captured him, they brought him up to Nebuchadnezzar king of Babylon, to Riblah in the land of Hamath, where he pronounced judgment on him. Then the king of Babylon killed the sons of Zedekiah before his eyes in Riblah; the king of Babylon also killed all the nobles of Judah. Moreover he put out Zedekiah's eyes, and bound him with bronze fetters to carry him off to Babylon. And the Chaldeans burned the king's house and the houses of the people with fire, and broke down the walls of Jerusalem. Then Nebuzaradan the captain of the guard carried away captive to Babylon the remnant of the people who remained in the city and those who defected to him, with the rest of the people who remained"
<!-black-> In chapter 3 Habakkuk sings a song of high praise to God in the form of a prayer- he believes and accepts God's answers to him. <!-black-> Sometimes musical lyrics are hard to follow but they are used for a purpose and chapter 3 is full of lyrics that made a lot of sence to the folks who lived in Judah at that time. <!-purple-> "A prayer of Habakkuk the prophet, on Shigionoth"
<!-black-> The Hebrew word "Shigionoth" is a word associated with music. It denotes the direction of music or singing, or may have been a musical instrument. This word is used in a similar context in the title to Psalm 7. <!-purple-> "I have heard all about You, Lord, and I am filled with awe by the amazing things You have done. In this time of our deep need, begin again to help us, as You did in years gone by. Show us Your power to save us. And in your anger, remember your mercy"
Habakkuk wants some answers from God about the invasion of his country by hostile armies. The same answer may well be applied to any future question when Israel is once again invaded by hostile armies. The answer lies in the history of Israel. God has performed some wonderful miracles for Israel in by-gone days. Habakkuk indicates that what God has done in the past for Israel, He intends to do again in the future. (Habakkuk 3:16-19). Faith is the ability to trust God in spite of one's adverse circumstances. (1 Samuel 18:6-7), and at other times. However, this song is a song of faith sung about 70 years before they received their victory over the Babylonians. <!-purple-> "Remember the days of old, Consider the years of many generations. Ask your father, and he will show you; Your elders, and they will tell you: When the Most High divided their inheritance to the nations, When He separated the sons of Adam, He set the boundaries of the peoples according to the number of the children of Israel. For the Lord's portion is His people; Jacob is the place of His inheritance. He found him in a desert land and in the wasteland, a howling wilderness; He encircled him, He instructed him, He kept him as the apple of His eye"
<!-purple-> "God came from Teman, the Holy One from Mount Paran. Selah. His glory covered the heavens, and the earth was full of His praise"
(Deuteronomy chapter 32, Judges chapter 5, and Psalms 68 & 113). <!-black-> God is so great that He is the creator of heaven and earth. He can do anything that He wants to. <!-purple-> "And His brightness was as the light; He had horns coming out of his hand: and there was the hiding of His power"
<!-black-> A horn is a symbol of power. This is in God's hand. This means that God has a very powerful hand or that He is all powerful. God appears to hide His power sometimes in His silence and in His patience. But He always moves at the right time and does the right thing. His motive is always one of love with their ultimate welfare in mind. <!-black-> Combining these lyrics with the context we can observe that nearly the same anxiety and trial had been faced before by God's people (the godly remnant) and they always came out victorious by God's righteous holy hand. Then Habakkuk goes on to give us in this song a few examples of this from their past history. <!-purple-> "Before Him went the pestilence, and burning coals went forth at His feet"
<!-black-> God also uses corrective punishment (pestilence): Joel chapter 1. The idea here is similar to one of tea bag Christians. Christians are never so strong until they are dipped into hot water. Coals are sometimes used as a symbol of purification (Isaiah 6:6-7) but in this context they appear to be used as a symbol of judgment. <!-black-> The message here is that God is going to judge and purify the folks of Judah with the Babylonians to cleanse them from their idol worship. <!-black-> Where in the bible are coals used as a symbol of judgment? <!-purple-> "At the brightness before Him, His dark clouds passed through, hailstones and coals of fire passed"
<!-purple-> "A smoke went up out of His nostrils, and fire devoured out of His mouth; coals were kindled by it"
<!-black-> God is very GREAT and HOLY and above all. <!-red-> "The Lord said to Moses, "Take your shepherd's staff, the one you used when you struck the water of the Nile. Then call some of the leaders of Israel and walk on ahead of the people. I will meet you by the rock at Mount Sinai. Strike the rock, and water will come pouring out. Then the people will be able to drink." Moses did just as he was told; and as the leaders looked on, water gushed out"
<!-purple-> "Then Moses lifted his hand and struck the rock twice with his rod; and water came out abundantly, and the congregation and their animals drank"
<!-black-> Israel was facing extermination in the wilderness- not from any foreign army but from thirst. They had no water. Then God worked a miracle on their behalf and saved them. This was a time of trial that turned into rejoicing for all of the Israelites. <!-purple-> "The sun and moon stood still in their habitation; at the light of Your arrows they went, at the shining of Your glittering spear. You marched through the land in indignation; You trampled the nations in anger. You went forth for the salvation of Your people, for salvation with Your Anointed. You struck the head from the house of the wicked, by laying bare from foundation to neck. Selah"
<!-black-> This was a time of national trial that turned into rejoicing for the Israelites. <!-purple-> "O God, when You marched before Your people, when You walked through the wilderness"
<!-purple-> "Blessed is the Lord; He daily bears burdens for us, the God of our salvation. Selah. Our God is the God of salvation"
<!-purple-> "You thrust through with his own arrows the head of his villages. They came out like a whirlwind to scatter me; Their rejoicing was like feasting on the poor in secret. You walked through the sea with Your horses, through the heap of great waters"
<!-black-> God delivered the Israelites during the time of Moses by opening the Red Sea for them so they would not be exterminated by Pharoah and his army. God went through the Red Sea with them. Horses in those days were like army tanks are today- the thought being that God was ready and willing to do battle for them. <!-purple-> "And with the blast of Your nostrils the waters were gathered together; the floods stood upright like a heap; the depths congealed in the heart of the sea"
<!-purple-> "When I heard, my body trembled; my lips quivered at the voice; rottenness entered my bones; and I trembled in myself, that I might rest in the day of trouble. When he comes up to the people, he will invade them with his troops"
<!-black-> Now Habakkuk has to face his time of national trial. The Babylonians are coming and it looks like the Israelites might be exterminated. But he depends upon God through his faith. As in the past, it will be a time of national trial but then rejoicing will come with their eventual victory. <!-purple-> "Though the fig tree may not blossom, nor fruit be on the vines; though the labor of the olive may fail, and the fields yield no food; though the flock may be cut off from the fold, and there be no herd in the stalls yet I will rejoice in the Lord, I will joy in the God of my salvation"
<!-black-> Habakkuk's encouragement to us is wonderful- no matter what the world, the flesh, and the devil throw at you to try to turn you away from the Lord- do not look at your circumstances. Look to God and keep your eyes on Him. Your faith in God will see you through it. <!-purple-> "Why are you cast down, O my soul, and moan within me? Hope in God; for I shall praise Him for the salvation of His face"
<!-purple-> "Yet in all these things we are more than conquerors through Him who loved us"
<!-black-> No Matter What, Keep Looking Up! <!-purple-> "I trembled inside when I heard all this; my lips quivered with fear. My legs gave way beneath me, and I shook in terror. I will wait quietly for the coming day when disaster will strike the people who invade us. Even though the fig trees have no blossoms, and there are no grapes on the vine; even though the olive crop fails, and the fields lie empty and barren; even though the flocks die in the fields, and the cattle barns are empty, yet I will rejoice in the Lord! I will be joyful in the God of my salvation. The Sovereign Lord is my strength! He will make me as surefooted as a deer and bring me safely over the mountains." <!-black-> What is God saying? I believe He is saying that He will see you and I through each and every trial that we face. To my way of thinking, these song lyrics refer to victory after a tough trial is finished. These song lyrics help us keep our eyes fixed on Jesus. <!-purple-> "I will rejoice in the Lord, I will joy in the God of my salvation"
<!-red-> Then the Lord said to me, "Write My answer in large, clear letters on a tablet, so that a runner can read it and tell everyone else. But these things I plan will not happen right away. Slowly, steadily, surely, the time approaches when the vision will be fulfilled. If it seems slow, wait patiently, for it will surely take place. It will not be delayed..."
<!-black-> Habakkuk's nation will rise again from the ashes. They will have gone through a horrible trial of their faith. This is cause for them to sing and praise the Lord. Habakkuk's faith helped him to see past the adverse circumstances to see a very big and powerful God who is in control of it all. <!-black-> You and I may have to go through some horrible times. But when the trial is over in victory we can rejoice that God brought us safely through it. (Romans 8:28, Psalm 37:5, 2 Timothy 1:12). <!-black-> God is in control of His universe and He is working out His own plan in His own time. What you and I have to do is to simply trust God. <!-black-> As for God's people- there is yet to be a glorious future and a kingdom where Christ will rule supreme. Christ is coming in the end times to Jerusalem to rule there as the King of Kings and Lord of Lords. He will bring salvation with Him. Deuteronomy 33:2-3; Psalms 18:8-19, 68:8, 77:17-20; Isaiah 63:1-6; Revelation 19:19-21. <!-black-> In conclusion, we see that chapter 3 is a beautiful song and the lyrics are very meaningful.